Last weekend while shopping for a new bed we stumbled upon Ms. Thomas' Lovely Tea House on the NW corner of Mc Kellips and Power in Mesa. Dolores at Mattress Firm had nothing but praise for the establishment and I couldn't wait to check it out. I stopped in late last week to check out their gift shop (fabulous!) and I vowed to go for tea as soon as possible. As HuzBen is not fond of tea and it took me a few days to find a dining partner. Thankfully my step mom Susan was as excited as I was to go there. We stopped in today for tea and some shopping. Dolores was spot on, the place is wonderful. The decor is Victorian inspired, tastefully done but not cluttered. It reminded me of tea in my Aunt's parlor many years ago. The tea settings are beautiful and they include a honey pot at the table as well as sugar cubes. The tea was kept hot by a delicate looking silver teapot warmer (see blurry cell phone photo above) that I would have purchased in a second if they sold them in the gift shop. 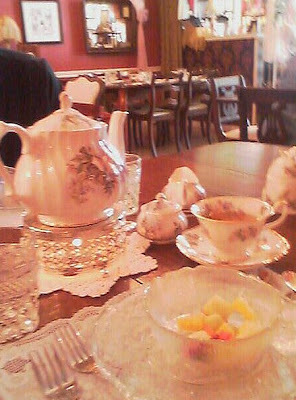 We had the Miss Marianne Tea, which consists of a fruit cup, quiche, scones, tea sandwiches and sorbet. Other options omitted the quiche or added soup so you could customize your afternoon tea to your level of hunger. There are also some a la carte items and breakfast offerings. The food was fresh and tasty. I do wish they offered more varieties of tea. A big plus over another popular tearoom in Mesa is that Ms. Thomas keeps her gift shop separate from the dining area. It was nice to enjoy a quiet lunch without someone kicking your while chair trying reach the price tag on a bottle of hand lotion. Ms. Thomas' Lovely Tea House is located at 6620 E, McKellips, Suite 102, Mesa, AZ. Phone 480-807-5133. Hours of operation are Mon-Sat 8:30am-2:30pm. Reservations strongly suggested. i just visited Mrs. Thomas's last Saturday. my friends and i thoroughly enjoyed it. hoping to take my daughter there today. btw, you have a lovely blog.